When the fog in my brain isn't too thick, I tend to get random wacky ideas in my head. Most are forgotten within five minutes, but others, like a Cadbury inspired cupcake, manage to stick around long enough for me to jot it down somewhere. I did a quick pinterest search and sure enough I'm not the first one to think about shoving a big ol' cadbury cream egg inside a cupcake... the thing is, I've got two sticking points in my head. One, the big eggs seem to take up an awful lot of the cupcake. Two (and more importantly), why is everyone doing chocolate on chocolate here? What makes an Cadbury Cream Egg different is the filling, so why not base the cupcake on something different? TO THE INTERNET! I do a another quick pinterest search for sweet cream cupcakes, but nothing really shows up. Hmmmm, how odd, I'm surprised I cant buy a sweet cream cake mix, let alone find one on pinterest. Off to google then... wow, only a few meaningful hits, including this recipe from Erik Homemade. Well, I guess we're going with that recipe and then adding my own special Dubba branded ideas. Ok, ready everyone? Bakers note: at first I thought the mixture was a bit thin, but as soon as I started pouring it, it turned out to be a little too thick. Something needs adjusting, not sure what. Here are the cupcakes in prep. 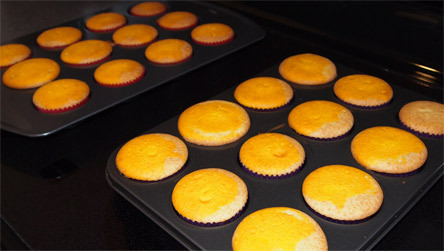 I decided to get overly creative and tried to add a yellow "yolk" to the cupcakes. My daughter thought I was adding some flavor, but it's just food coloring. Whoopsy, the yellow seems to have gone everywhere. Let's cut them open to see how they are doing. To add a little bit of cookie science to the whole cupcake event, I decided to do a little refrigeration experiment. In the red trunks (left side), we have the warmed eggs. In the purple trunks (right side), we have the refrigerated eggs... and that made absolutely no difference of how the Cadbury eggs melted. Apparently using the freezer would have been the smartest choice. Uggg, live and learn. The worst part is that the Cadbury chocolate has merged with the bottom of the cupcake to form some odd plastic like substance --- See, in the red wrappers, I put the egg in first and they melted a bit while I prepped the mix. For the purple ones, I poured in the mix and then added the chilled eggs. Thing is, I think I may have pushed some eggs further down than others. It's a rookie mistake and I'm still kicking myself for it. On Second Scoop: Now that I've had a few days to reflect (and sample), I think a sweet cream frosting (but keeping the chocolate bar crumble) would be a better fit for this one. You don't need to be blown away with milk chocolate frosting, instead I'd much prefer a quality sweet icing on top.